"Savo, don't do it. She is ours! Her aunt brought her to us. She is ours! She should not have finished college! She should not have gotten married! We want her to die! Death ...St. Matrona protects her!" The monk didn't give up. He continued reading. Prayers, hymns, psalms. As he intensified praying, the invisible power attacked the girl stronger than before. She cried, shook and screamed for the whole Divine Liturgy. And then peace surprisingly came. The woman's body relaxed with visible relief. The demons left the suffering human being. She went out of the church as if nothing had happened. The scene is not an excerpt from the one of Hollywood's blockbuster horrors. It is a reality that Sonja Brankovic, a 28-year-old Bosnian woman witnessed at Sunday morning Liturgy, in the Serbian Orthodox monastery Saint Ilija, Krupa, near Banja Luka, a few days before Pascha (Easter) 2011. She could not believe what she saw, but over time she had to accept that the presence of evil was more than obvious. It finally became clear to her that Satan does not attack only Catholics, as Hollywood has been filming for almost 40 years, but also the Orthodox Christians of which she is one. Unfortunately, the rich tradition of Orthodox exorcism stays in the shadow of "The Exorcist", launched in 1973 and primarily popularizing the Roman rite. Even the Baylor Religion Survey (2007) which finds that nearly four in five of respondents believe in demon possession, four decades after Hollywood's expansion of exorcism, does not present any statistical data within the Orthodox sample. However, it is a significant fact from Russian Trinity - Sergius Lavra illustrating that three to five persons are possessed among the hundreds of those that regularly attend Liturgy. That which people see in films is usually exaggerated drama. There is no levitating bed, spinning head or green-pea soups disgorged over the priest. "An accurate depiction of an Orthodox exorcism appears in a Russian film "Ostrov" says Father Ioannis, a monk and confessor of Simonos Petras Monastery, Mt. Athos, accenting the compilation of prayers as the essence of the Orthodox exorcism. 5. Anointing with oil, with prayer of anointing that is the same prayer used in the service of healing unction. 6. Three prayers of exorcism by St. Basil and four prayers of St. John Chrysostom. According the Typikon of St. Sava Monastery, Palestine, the blessed oil used in exorcism is removed from the temple and kept in the possession of the person receiving the exorcism for protective custody throughout life. At the time of the exorcised person's death, the residual oil will be buried with the remains in the coffin. Father Juvenily Repass, an Instructor and Chaplain at St Herman's Orthodox Theological Seminary warns that exorcism services would be "a grave sin and spiritually dangerous, "for a non-priest and layman. He says: "The service of exorcism is a very serious matter so even the priest should consult with the bishop before practicing it." 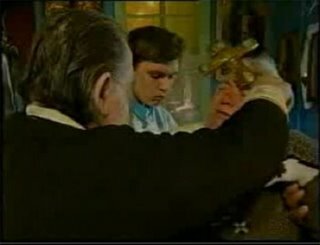 Unlike the Roman Catholic Church that elevated the Office of Exorcist, as a special exorcists unit, all Orthodox priests are trained and equipped to perform exorcism primarily as an obligatory part of Orthodox Baptism. Four prayers appear in the early portion of the Baptism service known as "The Making of a Catechumen." The Orthodox Greeks practice an unique exorcism against demonic influence known as "Evil Eye" or "Vaskania", a phenomenon deeply rooted in pre-Christian pagan tradition, but also widely present among other cultures. There is belief that some people through jealousy or envy can bring harm upon other people. It is considered that such people are demon-possessed, overlooking special and attractive people such as: beauties, those born on Saturday afternoon (time of Christ's birth), babies forty days after their births and young children. Affected persons suffer from discomfort, dizziness, whining, sleeplessness, peevishness, headache and pain. Orthodox priests read a special Prayer for overlooking. The special small crosses from Mt. Athos made of unicorn's horn and oil from sacred lamp in church are also strong defense against the demon acting from person with evil eye. The Greek Church permanently confront some groups of self-proclaimed exorcists (mainly old-women) that traditionally practice their own rite against " evil-eye" that includes religious procedure with olive oil, water and Cross, but opposite to recommendations of Church and The Great Book of Needs. The monks from Russian Valaam monastery consider that everyone is possessed at some level, depending how much they are burdened by passions, so they recommend living according to God's commandments: fast, prayers, confession, repentance and Holy Communion." "In summer 2010, monks from monastery Hilandar [Mt. Athos] exorcised a possessed boy. Despite prayers that lasted an entire week, the demons did not vacate the boy. Then I suggested to boy's father to repent and make confession. Because the father never confessed before this time, his son had become fertile ground for the demons. Indeed, the son had suffered for years just as the father and other family members had suffered by observing the child without recourse to resolve the problem on their own. This occasion was the only way to awaken the sinner. The father's repentance and confession were key to the success of our exorcism prayers." Archimandrite Petar Dragojlovic, Hegumen of St. Nicholas monastery, Vranjina, recalls a young woman whom he exorcised in 2005. This woman had been possessed by seven demons after having practiced spiritualism with her grandmother prior to the elder's death. "When grandmother died, she came to see her last time expressing desire to be beside her body that night. At the midnight, the demons began to sing and rejoice as they took the grandmother's soul because the old woman has served them through spiritualism. All seven demons entered into the girl. Until then she was an excellent student at Belgrade University with high grades. After possession she could not pass any exam. I have read the prayers to her in the Cetinje Monastery. Only after persistent reading of prayers by a year she received healing. But every time she went through the agony. She screamed with a high-pitched tone. Her body shook as her eyes gyrated. Her neck became twice as thick with distended veins. Two men were required to hold her in place for the prayers. Her strength was extraordinary. She now serves the God as a nun." "When mentally-ill persons approach the holy relics their bodies do not show contractions and other distortions. Moreover, persons with mental illness do not blaspheme, and they do not scream. On the other hand, demon-possessed persons look normal outside of holy places such as an Orthodox temple. However, when they approach the temple and the holy relics, they react because demons start to torture them." Hegumen's description parallels what Kurt E. Koch's described in his 1973 text, Demonology Past and Present differentiate demon possession from psychological disorders? The monks from the Orthodox Monastery of Vasilije Ostroski in Montenegro also confirm Hegumen's words. One of most famous Orthodox sanctuary for demonized people keeps the rich archives of personal testimonies of people that have been brought there as "lunatics" but after exorcism in front of the relics of St. Vasilije they have been healed continuing to live a normal life. Does it really work? The answer certainly depends on what you are closer to -- Hollywood or the Faith of more than 2000 years.